It's About Time You Check Out These 8 Indian Jewellery Labels! Jewellery is a major style statement and the perfect accessory to amp up a simple look. An exquisite piece of jewellery adds that extra oomph to your outfits and transforms into something totally glam and eye-catching! However, shopping for jewellery can be a little overwhelming, especially when there are a dozen sites out there! So, ladies, it’s time you check out our favourite fashion jewellery labels. And trust us, they are totally worth the splurge! Outhouse by Sasha and Kaabia Grewal is well known for beautiful handcrafted jewellery. Their designs are contemporary, unique and eccentric. Edgy chokers to bridal baubles in pearl and rose gold, the label creates pieces that are conversation starters. POPxo Recommends: Sparkle and shine in this pair of SYLPHINA COCOON EARRINGS (Rs 7,500) from Outhouse. If you’re a huge fan of quirky and distinctive designs, then Anomaly by Anam should be on your hit list. This brand is well known for its beautiful statement silver and gold jewellery pieces that are bold, chic and stylish. POPxo Recommends: Make a style statement with this pair of beautiful Justeene (Rs 4,600) earrings from Anomaly by Anam. 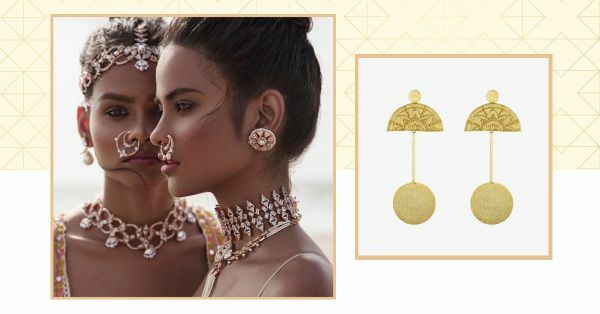 Valliyan by Nitya Arora is a jewellery brand that boasts of beautiful textured jewellery, funky tassel earrings, fancy choker necklaces and coloured stone jewellery. Valliyan is well known for its use of rare elements, semi-precious stones and crystals in producing exquisite handcrafted jewellery. POPxo Recommends: We are totally In love with these exquisite Silk Tassel Earrings 2 (Rs 5,515) from Valliyan By Nitya Arora. Isharya by Gauri and Radhika Tandon offers premium and high fashion designer jewellery, mostly inspired by Bollywood! It is the perfect blend of Californian chic and Bollywood grandeur. They specialise in gold-plated costume jewellery and have innovated with 3D printed jewellery that is lightweight and unique. POPxo Recommends: This Gold Plated Rose and Sapphire Swarovski Infinite Cuff (Rs 8,250) from Isharya is the perfect pick for a romantic date. Bansri by Bansri Mehta specialises in intricate costume jewellery that has an international appeal. Highly inspired by French fashion, this premium designer jewellery brand is well known for its unconventional designs and convertible jewellery pieces. Featuring sterling silver as well as gold-plated pieces, the brands boasts a wide selection of necklaces, earrings, hair accessories, rings and body chains that are quite remarkable. POPxo Recommends: This pair of OSELYN WHITE EARRING (Rs 7,094) from Shop Bansri is perfect for a fancy brunch or dinner with your girls. Zevar by Geeta specialises in silver and gold-plated jewellery as well as kundan and meena-work pieces with beautiful and detailed motifs. The designs are mostly traditional and embellished with intricate stonework. POPxo Recommends: This TRIBAL SILVER TRIPLE JHUMKI (Rs 6,500) is the perfect pick for your best friend’s mehendi. Soranam by Sonia Malhotra produces exquisite kundan and pearl jewellery. This label is well known for their stunning maang tikas and pearl flower stud earrings. POPxo Recommends: Make a style statement in these Gold Finish Kundan and Pearl Flower Stud Earrings (Rs 2,987) from Pernia’s Pop Up Shop. Aaharya is well known for their intricate temple jewellery that is beautifully handcrafted. They also have a curated section where they customise jewellery according to individual style and preferences. POPxo Recommends: Flaunt this Flower Motif Statement Ring (Rs 2000) from Aaharya with a long anarkali and slay!